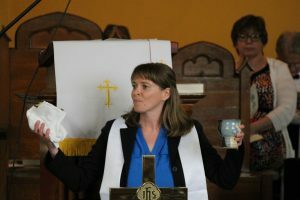 All are welcome to take Communion at Kerr Presbyterian Church. You are invited to The Lord’s Table regardless of Christian faith tradition or background. You are invited to put your trust in Christ, confess sin, and seek reconciliation with God and one another. Even those who doubt may come to the table in order to be assured of God’s love and grace in Jesus Christ. Children are welcome to take Communion as a means of experiencing Jesus’ love for them. We serve the bread (unleaven ed wheat bread) and the cup (juice) to those seated in the congregation. Please take the elements and wait until you are given both the bread and the cup, so that we can partake of them together. Are you interested in learning more about how Presbyterians understand the Sacraments (Baptism and Communion)? See Pastor KJ with questions or see the PC(USA) website for more information. Questions are always welcome at Kerr; we may not have the answers, but we love to seek the Lord together.